The work [Purcell violin sonata] showcased Gwilt's cleanly articulated lines in the Largo section and his acute sense of rhythm in the dancing melodies of the Allegro movement. Throughout the evening, Gwilt's technically facile playing was always witty and expressive. 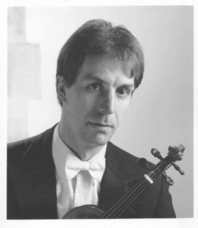 Star of the show is Richard Gwilt whose violin playing is inventive without being quirky, and always well shaped where others are routine. But what stands out most of all is the musical playing of violinist Richard Gwilt: the rich honest and gutty sound he makes on his Stainer violin stopped me in my tracks. Gwilt's interpretation of this elegant sonata was well-drawn and very stylish. London Baroque presents a new recording of the trio sonatas arranged (by Richard Gwilt) for their four-member ensemble. While the notes to this disc spend a great deal of time justifying the idea of transcribing such works, this defense is no longer necessary. The music speaks for itself. From the very first notes on this disc, one can hear the fine quality of the performance and the energy the musicians infuse into this recording. The opening movement of the F major sonata is played with brio and verve, and comes alive at a tempo which may seem surprising at first (a bit faster than is usual on the organ), but which fits it perfectly. All of the fast movements in these works feature this energy and drive, while the slow movements, such as the slightly fugal lento of the G major sonata, are highly introspective and subtle. This fine recording is certainly one of the best Bach discs of the year. London Baroque confirm their qualities as not only sensitive and well-balanced, but also creative in these fine transcriptions. This is an essential recording for Bach lovers, who will find new worlds of feeling in music that is certainly familiar.